WestLAND Group has been supporting the ENERGY industry for over 15 years. We have various multi-year on-call contracts, providing these industries with engineering, surveying and mapping services. WestLAND Group has extensive experience in route analysis, mapping, and planning, for electrical transmission lines and linear pipelines. This also include services to support Pipeline Safety Enhancement Program such as; right-of-way engineering, site planning and development, facility design/upgrades, environmental, traffic control plans, hydrostatic strength test, and construction support services from layout through as-built and completion drawings. At WestLAND Group we are committed to providing creative, innovative, and cost-effective services supporting our clients in meeting regulatory compliance goals. WestLAND Group has various on call contracts with Southern California Gas Company to provide survey and engineering services in support of their mutli-year program to replace and upgrade various pipelines throughout their service territory. WestLAND was responsible for all construction surveying and as-built surveying & mapping for a 30″ high pressure transmission gas pipeline remediation project. 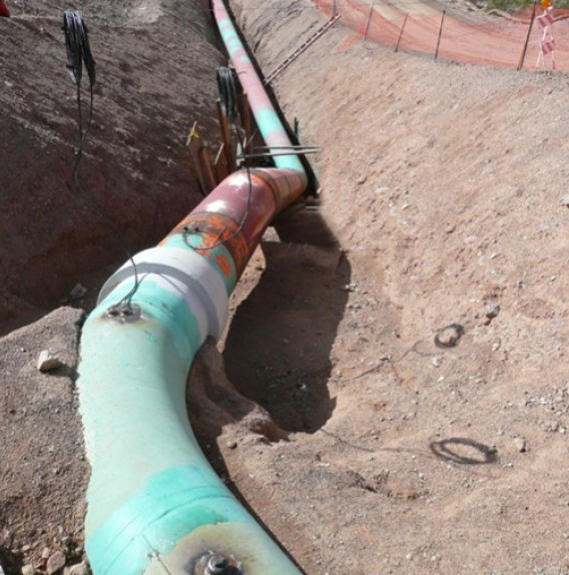 The project consisted of various pipeline relocations, replacements and repairs for approximately 120-miles across the Mojave Desert. WestLAND established a static GPS/GNSS control network along the entire pipeline alignment, performed public land boundary surveys to establish section corners and lines, and provided construction staking for pipeline alignment and right-of-way limits at various locations throughout the project. WestLAND survey crews also performed as-built surveys throughout the pipeline construction process to collect all pipeline features, such as welds, elbows, valves, etc. and generated as-built plan and profile drawings along with GIS/survey data files to be incorporated into existing GIS databases. WestLAND Group received an emergency work order request from Southern California Edison which required immediate attention. WestLAND provided survey, engineering and mapping support to the SCE engineering team that was performing emergency reconstruction design, slope and structure stabilization improvements and retrofits. Tasked with performing an extensive survey of a 48” spillway pipe, pipe supports and appurtenances as well as a precise topographic survey of a hillside after a major storm event resulted in catastrophic slope failure and structural destruction caused by erosion and debris flow; damages included shut-down of SCE hydro-electric generating station and closure of State Highway 178. Resource coordination began immediately, Project Manager and a field crew were deployed the following morning to assess the scope of work and site conditions. Continuous long-day working environment for the duration of the project was scheduled in order to meet desired timelines. Services included a combination of aerial surveying, laser scanning, GPS and conventional topographic surveying to execute the survey and provide high quality mapping deliverables that included generating TIN surface, contours, pipeline alignment, plan and profile view layout. Field crews marked horizontal stationing along pipeline which provided engineers key reference points and enabled them to quickly and accurately document areas that required pipeline and/or structural replacement. 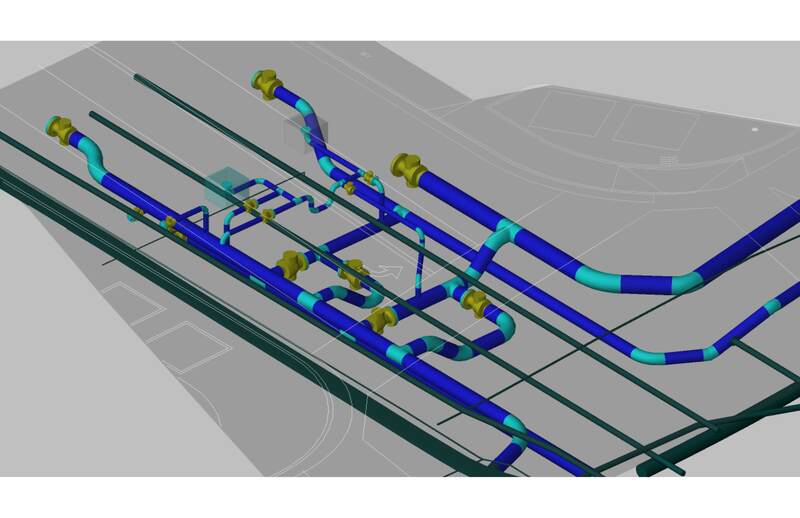 WestLAND designed and prepared drawings for a 36” pipeline retrofit project for various locations throughout Santa Ana. Topo and utility surveys were conducted and base maps prepared to show detail view of existing and proposed sections, in order to accommodate new pipe designs for pig receiver and launcher locations. WestLAND prepared all the plans required for permitting and construction to include demolition plans, pipe details, and material list. Traffic Control plans were prepared for the project areas, to include k-rails, crash cushions, and work zones for various construction phases per City requirements.